Being a charity trustee can be really rewarding. It is a great way to use your skills and experience to support a worthy cause. Whilst the desire to give something back is a great starting point, charity trustees need be aware that their role also brings a number of legal responsibilities. 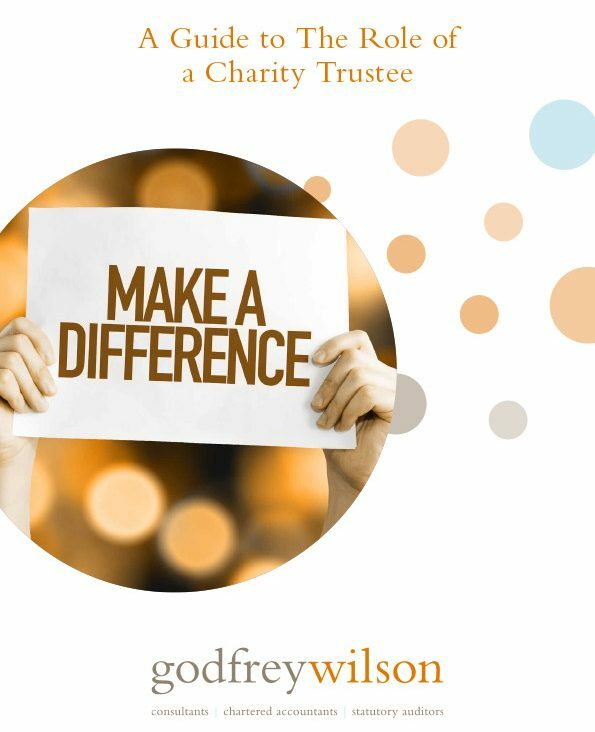 This guide is designed to provide an overview of the roles and responsibilities of a charity trustee. Please note that this guide refers to England and Wales only. Different rules apply to charities in Scotland and Northern Ireland. Charity trustees are the body of people who have ultimate responsibility for a charity. It is their responsibility to manage, govern and control the charity and to make decisions about the charity’s policies, objectives and strategies. Charity trustees may also be called the management committee, the board of management, the directors or other similar terms. Regardless of what they are called, they hold the same position of responsibility. The process for recruiting new trustees will be set out in the charity’s governing document. This may be known as its constitution, trust deed or memorandum and articles of association, depending on the legal form. The governing document will also cover aspects such as resignation, removal and reappointment of trustees. You have previously been removed as a trustee by either the Charity Commission or the high court due to misconduct or mismanagement. It is advisable for charities to obtain a declaration from new trustees confirming their eligibility to act. Charities may also wish to ensure beneficiaries or service users are properly represented on the board of trustees. Whilst this is an important way to ensure the charity remains effective and relevant, charities should refer to the guidance provided by the Charity Commission “CC24: Users on Board: Beneficiaries Who Become Trustees” to ensure they have fully considered the implications of this. Charities working with vulnerable people or children should carry out CRB checks on potential trustees. In some cases this will be mandatory. Charities should also take care to avoid potential conflicts of interest when selecting new trustees for appointment. The recruitment process should be carried out in line with the governing document. However, it is good practice to invite potential trustees to attend a trustee meeting as an observer before making the appointment. key strategic documents (vision, mission, objectives, business plans and budgets). New trustees should also be given a copy of the Charity Commission publication “CC3: The Essential Trustee” which provides detailed information on the roles and responsibilities of trustees. The primary duty of all charity trustees is to advance the purposes of the charity. However in the pursuit of this primary duty, trustees must fulfil a number of basic responsibilities. Trustees must ensure that the charity is run in accordance with its governing document, and in compliance with charity law and all other laws and regulations affecting its remit. In addition to laws and regulations, all charities must be operated for public benefit. The Charity Commission has extensive guidance on public benefit contained in three publications: PB1 – The Public Benefit Requirement, PB2 – Public Benefit: Running a Charity, and PB3 – Public Benefit: Reporting. Public benefit is considered in more detail in section 6. Trustees must accept ultimate responsibility for everything that the charity does. The trustees are responsible for all strategic and operational aspects of the charity and are accountable if anything goes wrong. In many cases the charity will have a team of paid employees who will carry out the day-to-day operations of the charity. Whilst it is permissible for trustees to delegate the implementation of decisions to staff (or other agents), trustees cannot absolve themselves of their responsibility to make the decisions and be accountable for them. The law imposes a duty of care on charity trustees. This means that they must exercise such care and skill as is reasonable in the circumstances. If a trustee has (or claims to have) specific knowledge or expertise, perhaps by way of their professional background, they can reasonably be expected to apply that knowledge to their role as charity trustee. In these cases the duty of care is therefore greater. If trustees do not have the required skills or expertise to make an informed decision, they can be reasonably expected to take professional advice. Charity trustees have a responsibility to safeguard the assets of the charity at all times. This includes tangible assets such as property, cash, stock and staff, as well as intangible assets such as intellectual property, brands and reputation. To effectively safeguard the charity’s assets, trustees have a responsibility to identify and evaluate potential risks facing the charity and to mitigate those risks accordingly. Trustees have collective responsibility for all actions and decisions. It is important for all trustees to take an active role in the decision-making process and for decisions to be taken according to majority rule. Some trustees may serve a particular function on the board (e.g. chair, treasurer or secretary). Whilst they may be responsible for explaining a certain subject area (e.g. the treasurer may present the financial accounts), the responsibility for decision-making is still collective. Trustees must always act in the best interests of the charity. They have a duty to exercise objectivity and independence when making decisions. Trustees must never allow their personal interests or views to affect their judgement. Conflicts of interest come in many forms: a conflict of interest could be where a trustee stands to benefit personally from a charity, or it could be where a trustee’s loyalty to another organisation affects their ability to prioritise the best interests of the charity. Charity law is very strict in ensuring that trustees cannot influence decisions in their favour. This section provides guidance on some of the more operational responsibilities of running a charity. By law (Charities Act 2011), all trustees must have due regard to the Charity Commission’s guidance on public benefit when planning, performing and evaluating the activities and objectives of the charity. Bear the guidance in mind when planning future activities. A statement that the trustees have complied with this law must be made in the charity’s annual report. When all risks are identified, they can then be prioritised. This is often done by scoring each risk for impact and probability, with high-impact, high-probability risks being ranked as the highest priority. Acceptance – accepting the risk if it is low impact and low probability. The risks should be compiled into a risk register document, which is regularly and actively monitored and updated by the trustees. Robust financial procedures are another key part of safeguarding a charity’s assets. Comprehensive financial procedures should cover everything from cheque signatories, authorising expenditure, budgeting processes, cash handling, opening post and accounting processes. Trustees are responsible for ensuring adequate financial procedures are in place and are complied with. If money is lost as a result of staff fraud, the trustees will be expected to explain to the Charity Commission what steps were being taken to prevent fraud and why they broke down. It is beyond the scope of this guidance to cover all potential reporting obligations for charities. The fundamental obligations are covered below. The Charity Commission regulates charities in England and Wales. All charities who are registered with the Charity Commission have to submit annual returns, annual accounts, and trustees’ annual reports every year. The deadline for submitting these documents is 10 months after the accounting year end date. The Charity Commission does not have the power to issue fines to charities who submit their documents late, but the public register will highlight any late submissions. Failure to submit documents altogether is a criminal offence. Many charities also fall under the remit of other regulators, e.g. charitable companies must also report to Companies House, and Community Benefit Societies to the Financial Conduct Authority (FCA). Fines may be incurred for late submissions from some regulators. Submission deadlines may also differ. All charities should apply to HM Revenue and Customs to be recognised as charitable for tax purposes. This can be done online. Charities are not normally required to submit tax returns, but HM Revenue and Customs is entitled to request that they do. If the charity receives a request from HM Revenue and Customs to submit a tax return, they must comply, even if there is no tax to pay. Policies marked with * are compulsory under Charity Commission regulations and must be disclosed in the charity’s annual report. A charity’s governing document will set out how frequently the charity trustees should meet, how many trustees constitute a quorum at meetings, and the procedures for calling and running meetings. There are no minimum requirements defined in law, although the Charity Commission would expect even small charities to hold trustee meetings at least twice a year. The primary consideration is that the frequency and structure of meetings is sufficient to ensure the trustees carry out their responsibilities and the charity is operated in an efficient and effective way. A charity that meets too often can become bureaucratic and cumbersome. However, a charity that meets infrequently can become unresponsive and inefficient because activities are delayed by waiting for board approval. Many charities use sub-committees to balance the needs of trustee input and operational efficiency. Sub-committees are working groups set up to deal with specific tasks or areas, such as finance, HR or fundraising. Sub-committees usually comprise representatives of both staff and trustees. Sub-committees cannot normally make decisions – instead they will examine an issue in detail and make a recommendation to the board of trustees. The trustees will be accountable for the ultimate decision. The charity should keep minutes of all trustee and sub-committee meetings. Minutes are an important legal record of key actions and decisions. Charities raise funds through a variety of activities, including soliciting donations, applying for grant funding, selling products or services, holding fundraising events and investing surplus funds. The rules concerning fundraising are complex and trustees should seek appropriate advice before planning any fundraising events to ensure they are fully informed of the implications. Charity trading – some fundraising activities may need to be operated through a trading subsidiary for legal or tax reasons. Trading subsidiaries can also be used to ring-fence riskier activities, thus minimising the charity’s exposure to risk. Tax and VAT – there are several tax concessions available to charities for fundraising events. These include VAT exemptions, zero-rate VAT reliefs, and the gift aid scheme. Some fundraising initiatives may have complex tax implications which could have an adverse financial impact on the charity. Appeals and restrictions – where donors restrict the use of their funds (or where the charity creates a valid expectation that funds will be applied for a particular purpose) the trustees have a duty of care to ensure all funds are applied in accordance with the restrictions. Public collections and lotteries – there are specific rules on public collections (street or house-to-house) and licences may be required. Lotteries and raffles are also regulated by specific laws. Data protection – does the charity comply with data protection laws when using a fundraising/supporter database? Professional fundraisers – where professional fundraisers are used, does the charity have proper written agreements in place? Governing document – charities can include clauses in their constitution that allow them to confer certain benefits on trustees, such as paying for consultancy or professional services, or renting and borrowing from trustees. Such clauses will generally need Charity Commission consent. Charity Commission agreement – charities can apply to the Charity Commission to make one-off payments to trustees without amending their constitution. Charities Act 2011 – a new statutory power was introduced in the Charities Act 2011 which allows charities to pay their trustees for providing services to the charity. Examples include providing consultancy services or receiving rent for a property. However, there are restrictions: unless it is expressly permitted in the governing document or by specific Charity Commission consent, a trustee must never be paid for their role as trustee (e.g. for attending board meetings), nor must a trustee take up paid employment with the charity. Trustees can be reimbursed for reasonable out-of-pocket expenses, e.g. travel costs for attending trustee meetings. Expenses should be reimbursed in line with the charity’s policy and must be disclosed in the annual accounts. Charities must always follow their own conflicts of interest policy. If trustees are set to receive a benefit, or have an interest in a connected party who is set to receive a benefit, this should be declared and the trustee should leave the meeting when the issue is under discussion. There are two different types of liability: (a) the liability of breach of trust e.g. acting negligently or without duty of care; and (b) the liability to third parties that occurs in the course of running the charity e.g. the financial liability under a contract. A trustee’s liability to breach of trust is inherent to their position as charity trustee. The law imposes a duty of care on all charity trustees, regardless of the charity’s legal form. If a breach of trust gives rise to a loss to the charity, the trustees are vulnerable to a claim to reimburse the charity for the loss. Such claims would be instigated by either the Charity Commission or the Attorney General. It should be noted that claims of this nature are rare. Incorporated charities (such as charitable companies and charitable incorporated organisations) have their own separate legal identity, which means they can enter into contracts in their own name. In these cases, it is the charity that is liable for losses and debts, rather than the individual members or trustees. The trustees’ liability is limited. Unincorporated charities (such as trusts and associations) do not have a separate legal identity. This means they cannot enter into contracts in the charity’s name. Instead the trustees collectively enter into the contract, but using the charity’s funds. Trustees of unincorporated charities are therefore personally liable for performing the terms of the contract, and for settling any liabilities if the charity runs out of funds. The trustees’ liability is unlimited. Trustee indemnity insurance is an optional insurance policy that protects trustees against claims against them personally. Policies vary, but generally speaking they cover claims relating to breach of trust or wrongful trading. They usually only cover cases where trustees have acted in good faith, and exclude cases of deliberate contravention of rules or gross negligence. Policies will not normally cover losses relating to the unlimited liability of trustees of unincorporated charities. Trustee indemnity insurance is regarded as a benefit to the trustees since it protects them personally rather than protecting the charity. The charity’s governing document must therefore include a clause to permit the use of charity funds to pay for trustee indemnity insurance.